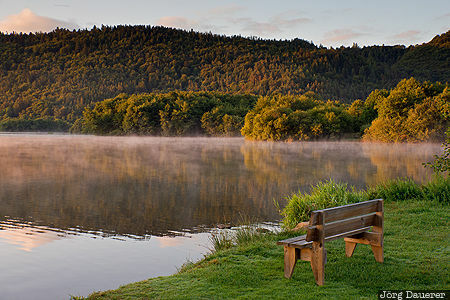 A lone bench at the banks of Lac Chambon at sunrise with morning mist over the water and the woods surrounding the lake reflected in the calm water of the lake. Lac Chambon is in Auvergne in the center of France. This photo was taken in the morning of a sunny day in September of 2015. This photo was the image of the month in February of 2017. This photo was taken with a digital camera.